Another book swap book revealed! 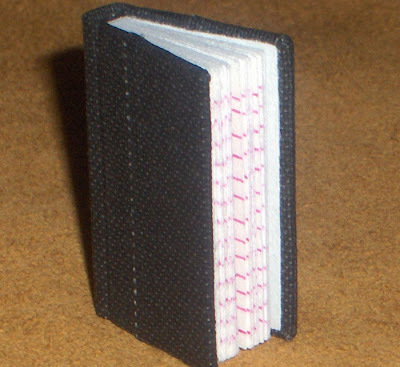 This little book and its matchbox were submitted to the book swap by eb, of Matchboxbook.Etsy.com. This is a hardbound journal made entirely with archival materials; the fabric on the cover is black buckram. The pages have ink lines that have been meticulously hand drawn. 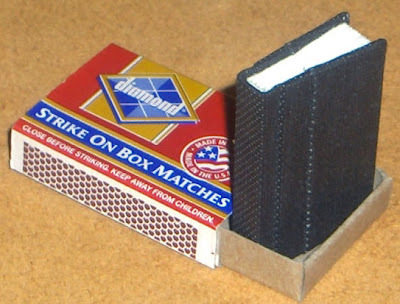 This little book fits perfectly inside the standard matchbox. Visit matchboxbook.etsy.com to see more. I love love love these tiny little things! Can't imagine working so small, wowza! I got my swap book today :D I'll be posting it on my blog later! such a beautiful little book! precious. The workmanship on these is fabulous!